Next Thursday is DNA day at the Southern California Genealogy Society’s Jamboree in Burbank, one of my favorite events. I particularly love the outdoor bar restaurant between the hotel and the conference center. Usually the weather is perfect for spending the evening there with friends. If you have been wanting to buy me a glass of wine, here’s your chance! The speakers for the paid DNA day sessions on Thursday, besides myself, include Blaine Bettinger, Leah Larkin, Paul Woodbury, Emily Aulicino, Tim Jantzen, Shannon Christmas, David Nicholson, Daniel Horowitz, Schelly Talalay Dardashti, Diahan Southard, Barbara Rae-Venter, David Dowell, and many more. My sessions are “DNA Segment Triangulation” and Using DNA and GWorks for Unknown Parentage Cases.” Click here for the full schedule. 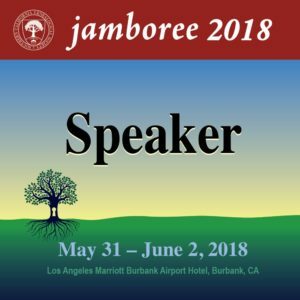 If you can’t get there, you can sign up for live streaming at http://genealogyjamboree.com/live-streaming-2018/ – sadly it is not free this year, but very inexpensive. In previous years you could buy recordings of many of the sessions, hopefully that will happen this year too. The main genealogy sessions start Friday morning, but there is at least one DNA related session at every time slot including an “Ask the DNA Experts” at 5pm (and yes I am one of them). Saturday also has plenty of DNA sessions. When my Dad rode up the elevator in our NYC apartment building, he was often asked if he was my father. I always thought I looked just like him and just like pictures of his mom, except for my nose which came from my mother’s side. 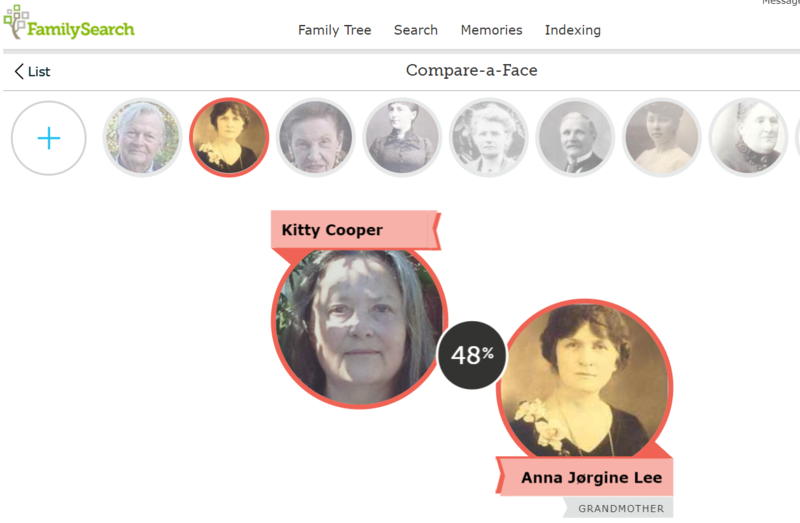 The other day my brother showed me a cool new tool that compares a picture of yourself to pictures of any ancestors whose photos are in the FamilySearch tree. Needless to say I promptly uploaded every ancestor image I could find! 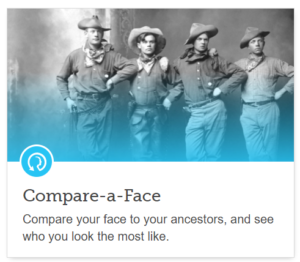 This tool is called Compare-a-Face and is part of the FamilySearch Discovery suite of tools. It is currently featured on the FamilySearch home page when you log in. I soon discovered that the original photo of me did not get compared to the new ancestor photos that I had just put there, so I uploaded another one. I had to try several different pictures of me to get the result I wanted from the comparison to my Dad’s mom. Notice that the images are shown in order of how like you they are: the best on the left to least on the right. You click on any little image at the top to get it front and center with a percentage of simularity. It makes me sad to be missing Rootstech this year (blame my husband) but I am experimenting today with viewing a few of the free streaming lectures online. To get the live stream just go to the Rootstech home page and sign up. Currently, you can watch only on the day of the lectures. 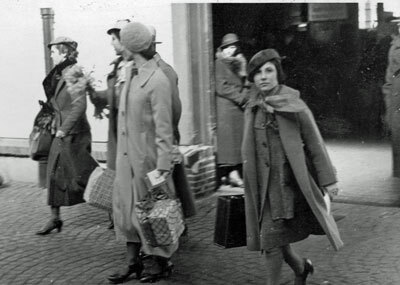 One of the pleasures of a conference like Rootstech is seeing old friends plus meeting and greeting many of your virtual friends, the ones you have researched with electronically but have never met in person. 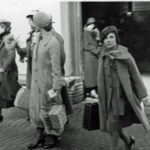 So it makes me sad not to be meeting fellow genetic genealogy blogger Roberta Estes who is attending for the first time. Follow her blog for daily reports. Another pleasure of this conference is the amazing Exhibit Hall. Every vendor has a booth and new features to announce. Much to blog about for weeks to come! Personally I found about two lectures a day were best for my own self pacing. Then of course there is the wonderful Family History Library next door; a reason all by itself to visit Salt Lake City. 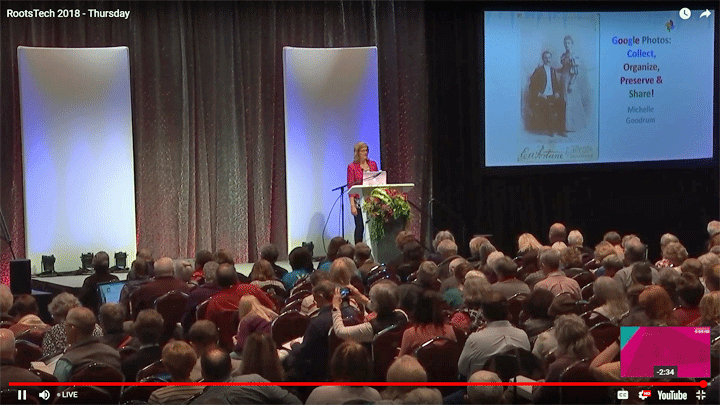 Today I went to Rootstech via streaming on my PC for a very informative lecture about using Google Photos from the in depth genealogist Michelle Goodrum. The nice thing was that I could stop the lecture and go play with my Google Photos as I learned about features I had never considered. She also discussed the app, Photo Scan, that you can use on your smartphone to scan images and document pages by taking a picture at 4 different spots to get rid of glare reflections and misalignments. The result is automatically added to your google photos. I had always known that my Android photos were magically whisked up into the cloud to my Google photos area at https://photos.google.com/ (you need to be logged in to your google account to see them). 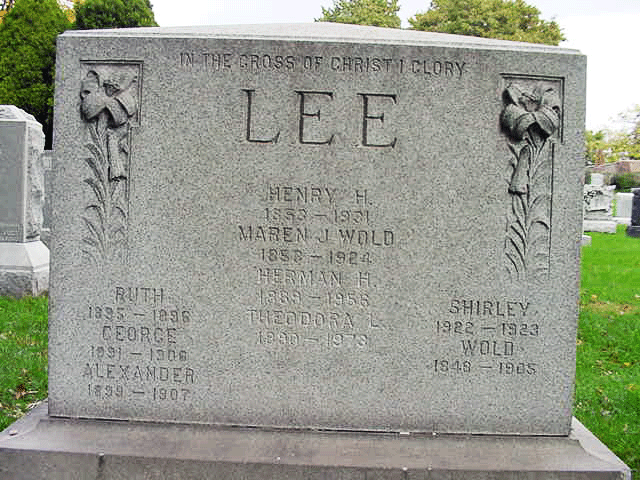 I had often downloaded one or two images from there to illustrate this blog or add to a profile on a genealogy site. But I had never realized all the ways Google had already organized them for me or that I could do some editing there plus add information and more organization!